Lava Canyon looking downstream toward the Swinging Bridge. 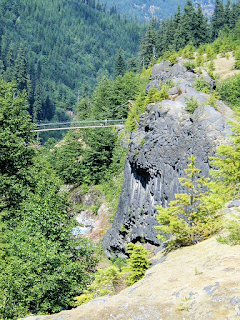 View of Lava Canyon and the swinging bridge. Gifford Pinchot National Forest, Washington, USA. 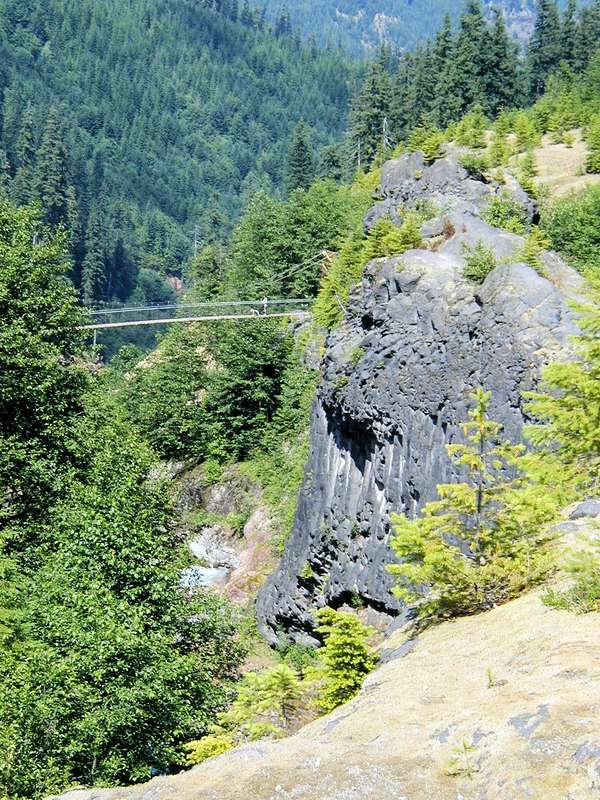 View of Lava Canyon and the high swinging bridge from upstream. A lady is crossing the bridge with her dog. The dog did NOT want to cross that bridge! Check the photo below of the bridge planks to see why. The bridge is about 0.7 miles from the trailhead parking lot, at approximately the half way point on the 1.6 mile loop trail. There are toilets at the parking lot. Part of the trail is paved and accessible. 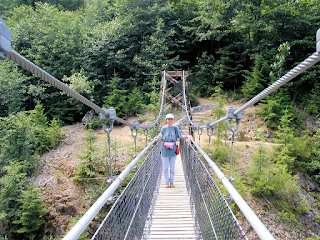 Woman on the Lava Canyon Swinging Bridge. My wife Julie on the swinging bridge on the Lava Canyon Trail. Her expression tells me it's time to stop taking photos and finish the hike! Gifford Pinchot National Forest, Washington, USA. 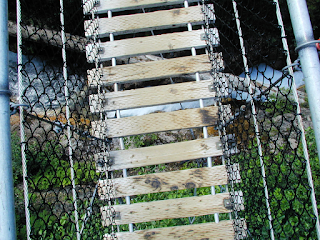 Lava Canyon Swinging Bridge Planks. If you don't like spaced planks this is not the bridge for you. Check out the Muddy River (that's it's name) way below. Gifford Pinchot National Forest, Washington, USA.